As you may have noticed, I’ve been collecting fleeces. You may also have noticed a dearth of projects made from said fleece. Okay, there was the hat, but what about the other eleventy pounds? Am I opening a fleece museum? Had I run out of places to sit? No, though now that you mention it…wait. No. That would be silly. Mostly, I’ve been sampling the fleece, playing around with blending, and generally trying to make the perfect yarn for each one. Raw fibre is a lot of work, and I think I’ve let that intimidate me into believing that if the yarn isn’t What That Fleece Was Meant To Be, I’ve let down the side; I’ve failed the fleece. Well, fie on that. There will always be more fleece (or if not, we’ll have bigger problems than my magpie tendencies), and whatever these ones were meant to be, it sure wasn’t stuffing for endless ziplock bags. 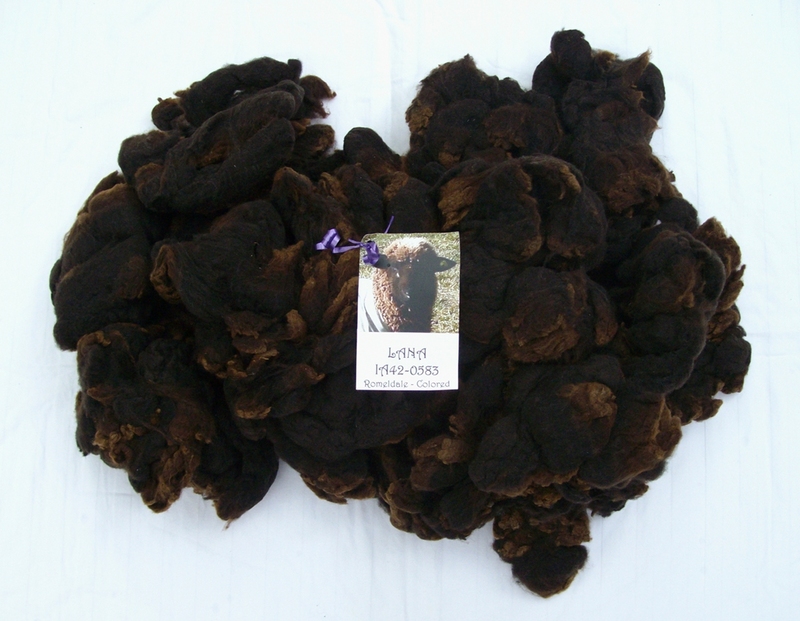 Besides, if I don’t spin the fleeces I have, how on earth will I justify buying more? So here we go. I’m jumping in. It’s time to take on a fleece-to-sweater spin. 27.2 oz./772g washed California Variegated Mutant/Romeldale hogget fleece — the first and probably the softest fleece this sheep will produce — from Peeper Hollow Farm. It’s easily my favourite of the bunch: crimpy, velvety, just springy enough, and a deep, rich, chocolatey black. I’ve spun up some sample skeins in 2-ply and 3-ply, and strangely for me, I prefer the 2-ply. This being a lamb’s fleece, the tips are a bit tender and made some neps (small lumps of broken fibres) when I started carding, so I’m going to try cutting off the most breaky tips to see if I can get the yarn just a little finer. It’s some seriously dreamy yarn, though; it feels just like velvet (have I already mentioned the velvetiness? It bears repeating), and knits up into a light, slightly drapey fabric. I’m thinking a long sleeved, scoop-necked pullover, fitted at the bust and then slightly flared towards the bottom. But first, I have to spin the yarn. Here we go. Deep breath. That fleece looks gorgeous. Should end up being something quite lovely. The sweater will be BEAUTIFUL! Reading this made me desperate to touch the yarn. Damn. I could send you a sample! Seriously, it’s like velvet. Have I mentioned that? Yeah. I love this post!! And I laughed out loud at the filling ziploc bags comments. My studio area is filled with those!! Can’t wait to see the progress on the sweater! Good job! I know what you mean… I have the same problem with really nice pads of paper, be they drawing or writing paper. Like the paper is too good for me to draw on. Really nice supplies can be intimidating that way. Which, as you point out, is utterly ridiculous. Stuff was meant to be used! I’m sure the sheep would be proud of your results, however you decide to spin them.